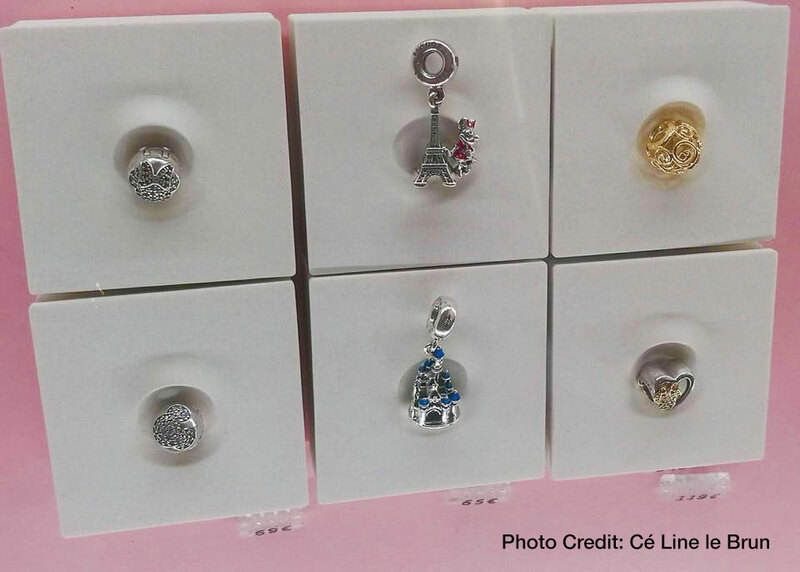 The new PANDORA Disneyland Paris charms are here! PANDORA has made its way to Disneyland Paris and to celebrate we have two new exclusive charms! These charms are only available at Disneyland Paris, however if you are interested in purchasing them please email me at dora@theartofpandora.com and I will put you in contact with a personal shopper at the PANDORA Disneyland Paris store! The exclusive PANDORA Disney Eiffel Tower & Minnie Dangle (797154EN09) is super adorable and was a favourite for me as soon as I saw a sneak peek of it a few months ago! 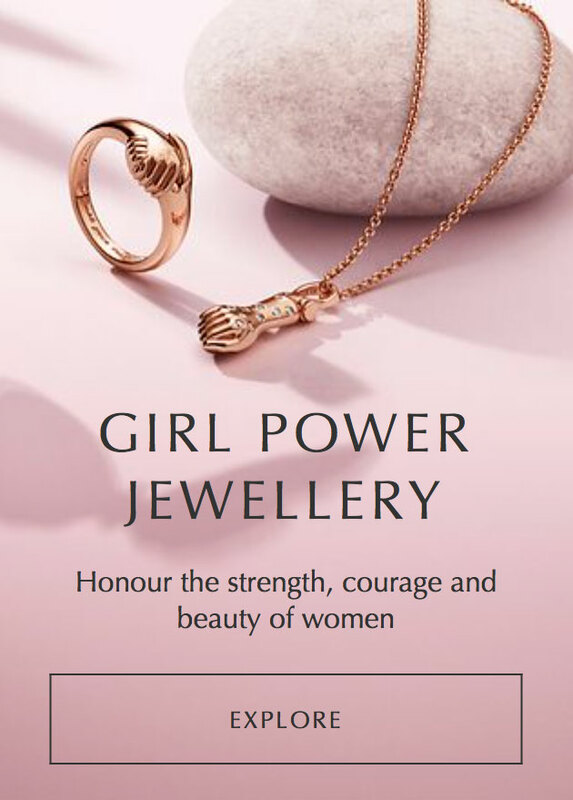 There have been a few versions of PANDORA Eiffel Tower charms, including a silver version, a two tone version which features a little gold heart and of course the stunning exclusive limited edition 14k gold version! Now we can add a Disney version to the collection! 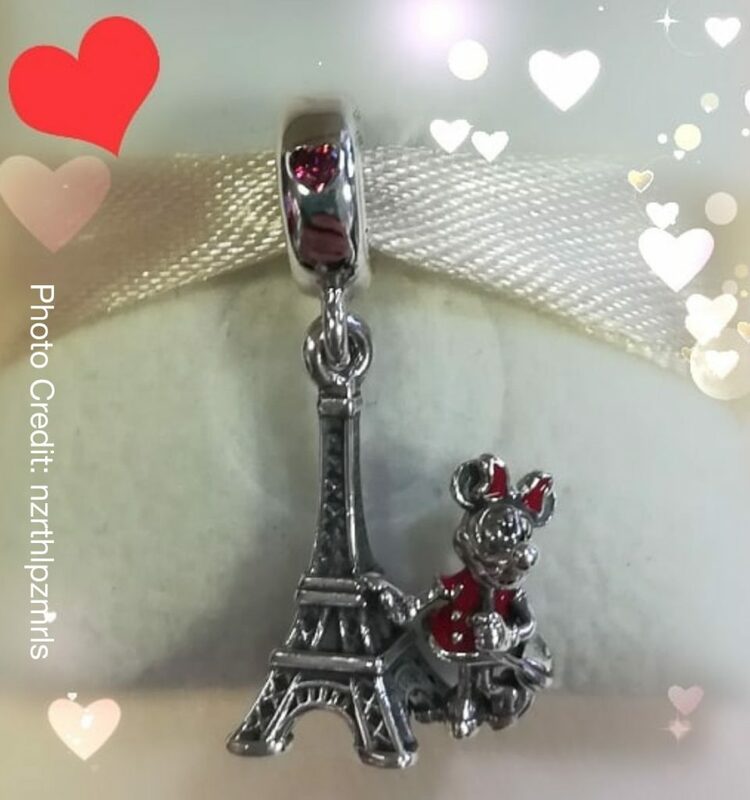 The PANDORA Disney Eiffel Tower & Minnie Dangle is based on the silver PANDORA Eiffel Tower charm (791082) but with a giant Minnie Mouse posing next to it! Although, maybe she isn’t actually a giant but is doing a fake ‘I’m holding up the Eiffel Tower’ cheeky holiday pose! Minnie’s dress and box are highlighted in red enamel and a matching red cubic zirconia heart glimmers on the bale. 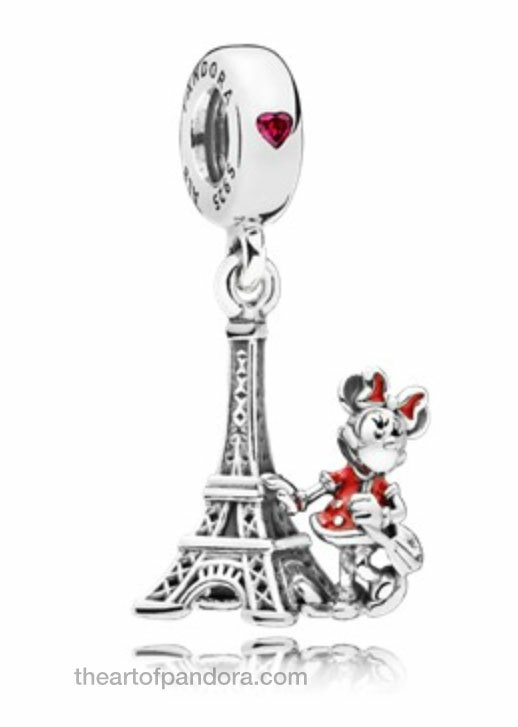 The PANDORA Disney Eiffel Tower & Minnie Dangle is €65 EUR. UPDATE: I just heard that the PANDORA Disney Eiffel Tower & Minnie Dangle will also be released in US Disney Parks in May 2018. 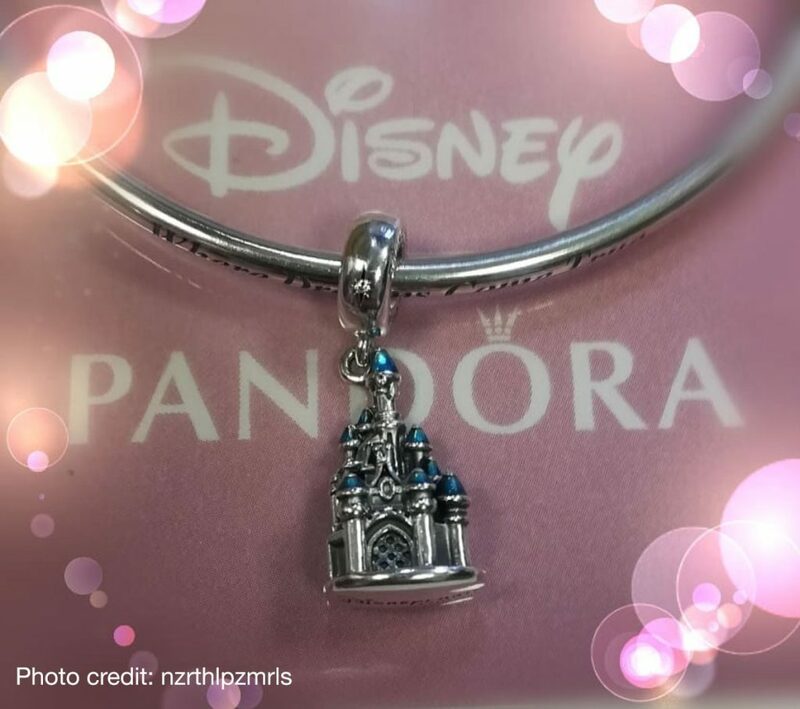 The exclusive PANDORA Disneyland Paris Castle (797151EN164) is of similar design to the previous PANDORA Disney castles but with the addition of Sleeping Beauty’s signature blue enamel that accents the castle turrets. The underside of the charm is engraved with the Disneyland Paris logo. It is a wonderful memento of your trip to Disneyland. The PANDORA Disneyland Paris Castle is €65 EUR. 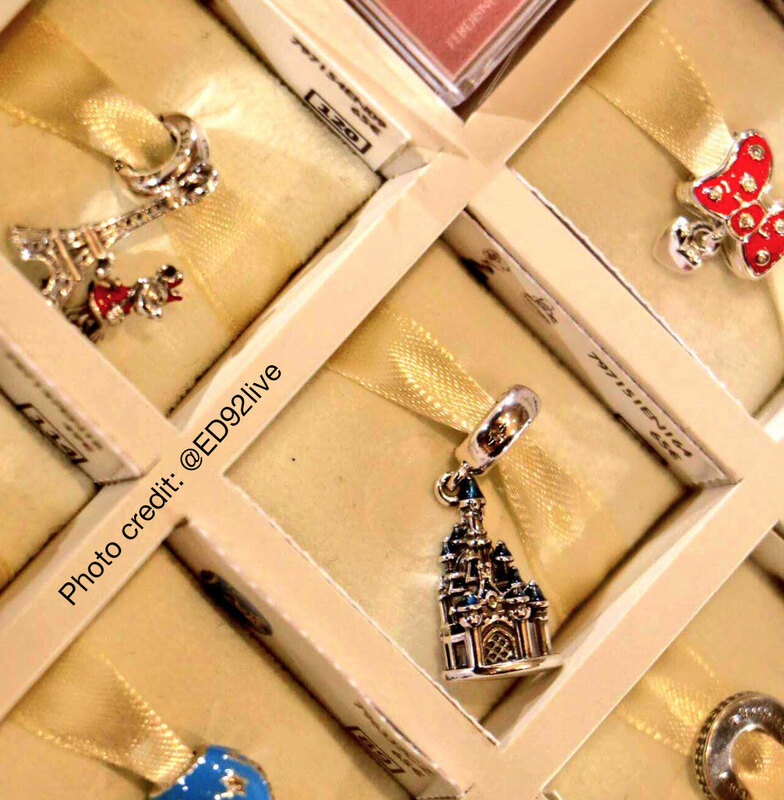 Here are a few live images of the two new exclusive PANDORA Disneyland Paris charms. These are so exciting! I absolutely love the Disneyland Paris castle! 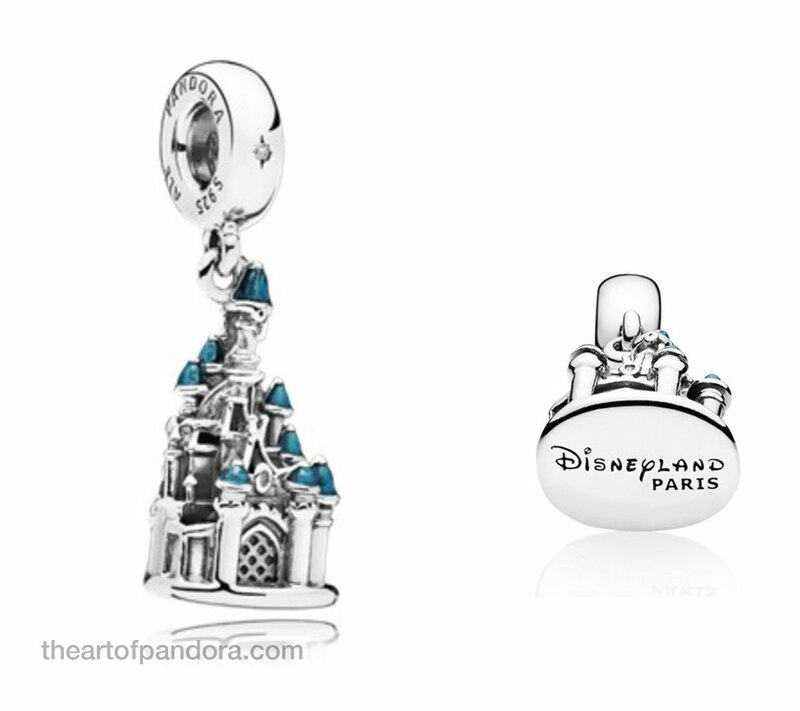 It really has been exciting with all the new PANDORA Disney Parks charms released this week! I really like the blue enamel on the Disneyland Castle, it makes it more interesting than the other castle charms. My favourite is the Minnie & Eiffel Tower Charm though and I’m thinking about adding her to my collection! 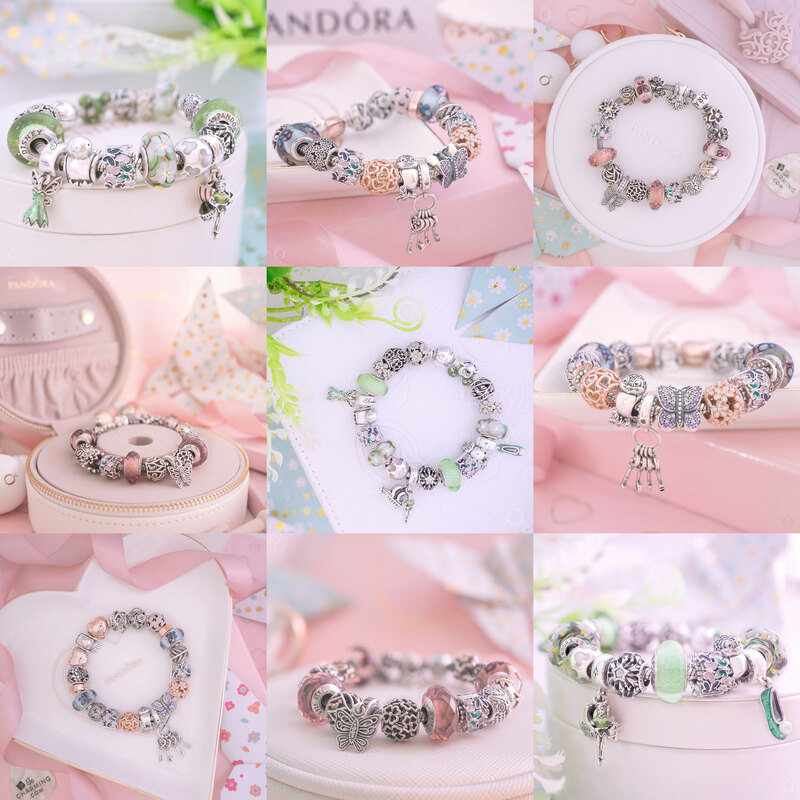 There are so many cute PANDORA Disney charms this year it is hard to choose! Thank you for commenting and have a magical day! Are these only available at Disneyland PARIS or all Disney Parks? Unfortunately they are only available at Disneyland Paris. 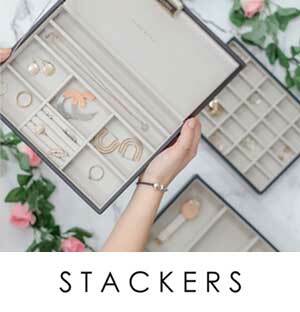 If you require help in purchasing them I have a friend who is assisting PANDORA fans and I can pass on her details to you. Please email me on dora@theartofpandora.com for more information. Thank you for your message. I have sent you an email. Do you know when they will be released in May in the US? And other infor? Thank you! I still haven’t heard any more information I’m afraid. The Disneyland Paris Castle will definitely be an exclusive to the Paris Park but the Minnie & Eiffel Tower may be available at some point this month in the US. 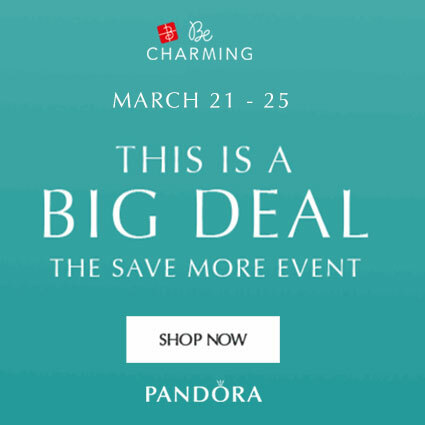 If you want to purchase either charm from Paris, let me know and I will put you in contact with a PANDORA fan who has offered to help. I was in Disneyland Paris in April and purchased the Effiel tower with Minnie attached..today tragedy happened and Minnie has fallen off from the charm..how can I do about getting it fixed or replaced seeing as the charms aren’t available within the UK. Please check your email for a reply. 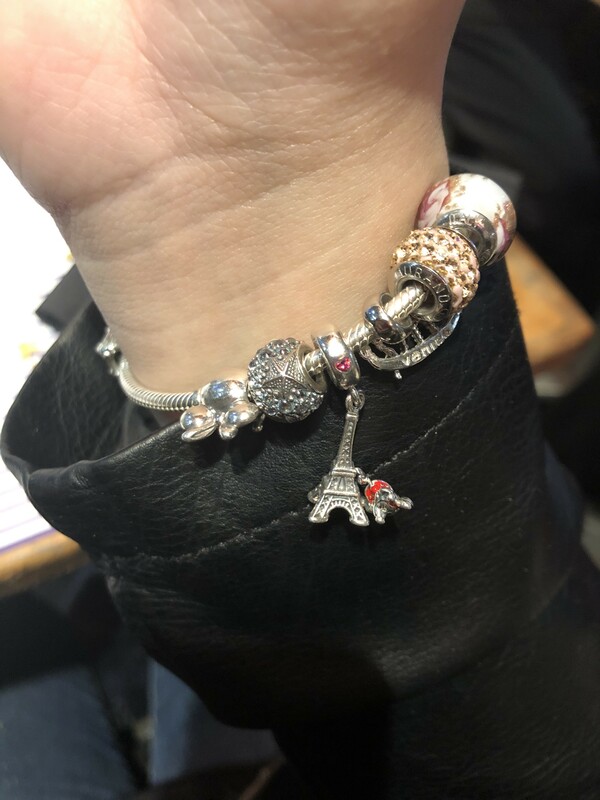 Hi, I was on March 14th at Disney Paris and bought Minnie’s charm with the Eiffel Tower. I also had the misfortune to see in less than 10 days of buying my broken object. I live in Brazil, can you tell me how to contact the store to complain? Our family went on a European vacation last June 2018. 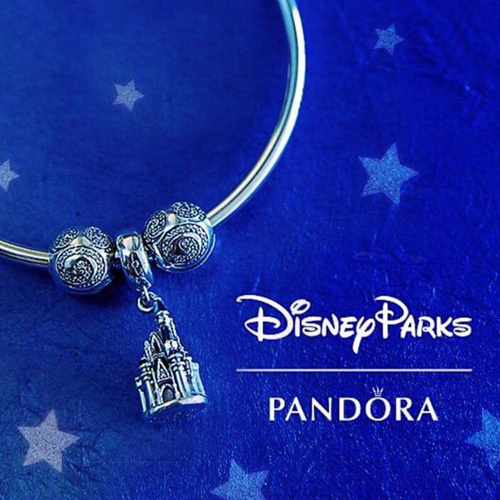 Unfortunately Disneyland Paris was out of stock of the Pandora Castle Charm. Is there anyway of obtaining one for my wife? I’d also be interested in other cities we visited on our vacation including Flourance, Pisa, and Rome. Thanks for your comment. 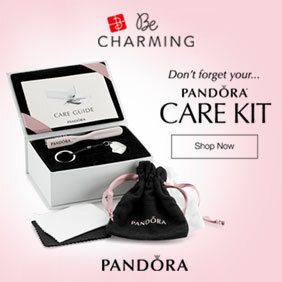 If you send me an email at dora@theartofpandora.com I will pass on the contact details to buy the charm. BOA TARDE GOSTARIA DE SABER COMO POSSO PROCEDER A TROCA DE UMA PEÇA EXCLUSIVA DA MINNI COM A TORRE EIFEEL COMPRADA NO PARQUE DISNEY. SOU DE PORTUGAL . There is a lady who can help you purchase the PANDORA Disney Parks Minnie & Eiffel Tower charm. If you send me an email on dora@theartofpandora.com I can pass on her details to you. Hola me podeis indicar si hay algun modo de hacer una reclamacion,mi problema es que el pasado 14/12/18 estube en Disneyland Paris y compre la torre iffel con la Minie,era para regalar el dia de reyes y el mismo dia se partio la Minie de la torre.he preguntado aqui en las tiendas pandora de sevilla españa y m dicen que en los primeros seis meses me la deben sustituir por una nueva ,es cierto? Y como lo hago? 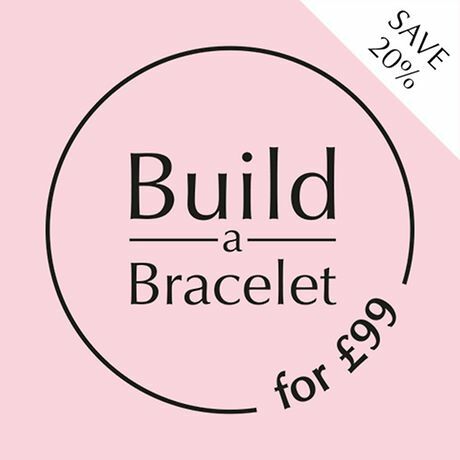 Perhaps you could try taking it to a jewellers to see if they could fix it for you? Yes she is! Send me an email on dora@theartofpandora.com and I will give you her details. El pasado mayo/18 estuve en Disneyland Paris. Para recordar la visita, compré un chat de la Torre Eiffel con Minnie. Al poco tiempo, la Minnie se cayó, lo que me puso muy triste… Recientemente, abrieron una sucursal de Pandora en mi localidad. Fui a ver si me podían ayudar, pero me solicitan mi ticket, el cual no encuentro. Quiero ver si me pueden ayudar a conseguirlo. Es muy importante para mi. I’m very sorry to hear about your problem and I’m trying to find a contact for you to resolve the issue. Please be patient as it might take me a little while. Sorry to hear about your bad experience. I am trying to find a contact for you to resolve the problem. It might take me a little while so please be patient and I will try and help. I’m sorry to hear that you are having problems with the charm. I have contacted someone at PANDORA headquarters about this issue and they are investigating the problem. Once I hear back from them I will let you know.